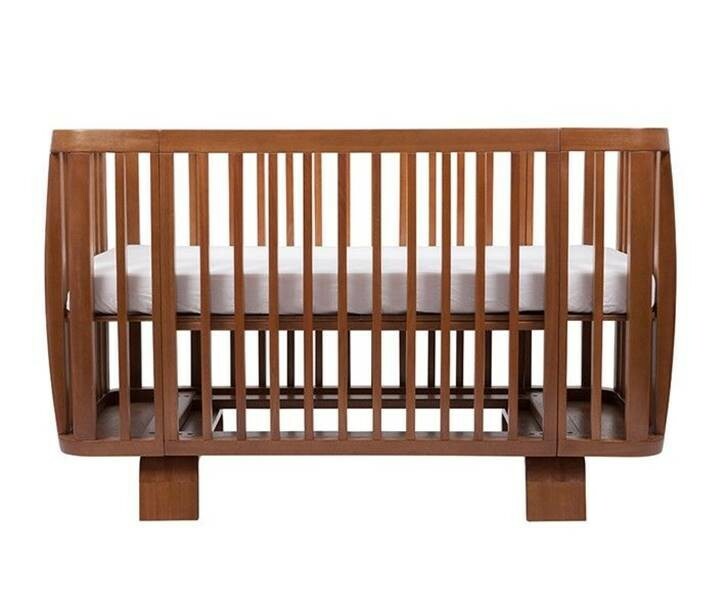 This beautiful solid wood Retro crib by Bloom is inspired by mid-century modern design, boasting unique curvatures and rounded elements. Eco-friendly touches like NO MDF or formaldehyde and low-VOC finishes make this crib both a design-savvy and sustainable choice for baby’s nursery. Two mattress heights means you can adjust the crib to suit your baby’s stages too. Best of all, you’ll save money in the long run because this sweet crib transforms easily from newborn bassinet to baby crib to a toddler bed with the addition of a toddler rail (sold separately). Im obsessed with so many of the cribs you review!!!! This beautiful solid wood Retro crib by Bloom is inspired by mid-century modern design, boasting unique curvatures and rounded elements. Eco-friendly touches like NO MDF or formaldehyde and low-VOC finishes make this crib both a design-savvy and sustainable choice for baby's nursery. Two mattress heights means you can adjust the crib to suit your baby's stages too.�Best of all, you'll save money in the long run because this sweet crib transforms easily from newborn bassinet to baby crib to a toddler bed with the addition of a toddler rail (sold separately).